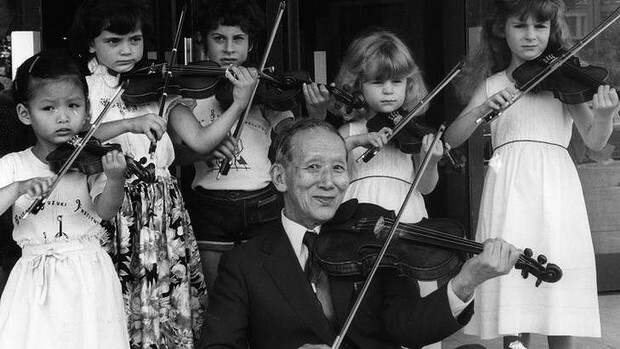 Dr. Shinichi Suzuki - a German-trained violinist - began teaching children the violin in Japan after the Second World War using a system he had been nurturing over the previous ten years. 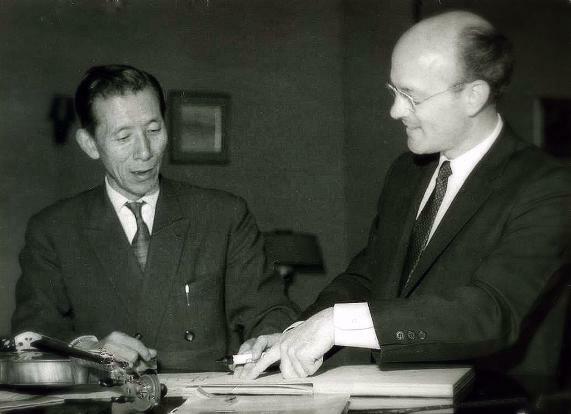 Suzuki opened the Talent Education Research Institute in Matsumoto, Nagoya, Japan implementing an educational concept and philosophy that he termed the “mother tongue" method due to its basis in language development. It is not the aim of Talent Education to produce concert artists, but rather to produce well-adjusted, self-disciplined people with highly developed abilities. Creating an environment conducive to developing children’s abilities is not a chance happening. Because the mother tongue approach uses games to instruct and emphasizes an environment free of anger and stress it can, however, be misunderstood by parents and music educators. Suzuki Talent Education is a serious approach to music study. Daily quality time between parent and child and a commitment to doing one’s best are the goals. Carol Gwen Kiefer is a registered Suzuki Association of the Americas teacher of both violin and viola. She holds a Master of Music in Education from Southern Illinois University Edwardsville, Illinois where she served as a graduate teaching assistant to Suzuki pioneer John Kendall. Kiefer enjoyed her time at SIUE taking graduate independent studies, violin lessons and pedagogy with Professor Kendall, pedagogy with Carol Smith, and collaborating with a host of graduate teaching assistants from around the world. Dr. Lili M. Levinowitz, professor of music education at Rowan University, directed Kiefer's thesis from Philadelphia, PA.
Kiefer holds a Bachelor of Music in Music Education from Temple University in Philadelphia, Pennsylvania, earning her Pennsylvania board certification as a K-12 upper strings specialist. She studied viola at Temple with the late Leonard Mogill, violist with the Philadelphia Orchestra, Edward Gazouleas, professor of viola at the Jacobs School of Music at Indiana University, and Geoffrey Michaels an Australian-born violinist and violist and Curtis alum. Kiefer was introduced to the Suzuki Method at Temple taking credited Suzuki pedagogy courses with Suzuki Association of the Americas teacher trainer, Linda Wear Fiore. Carol collaborates with her colleagues in GPSA and the Suzuki Association of the Americas to challenge her understanding of violin teaching, develop new ideas, and delve into current research to engage her students and the wider Suzuki community. Through her ongoing work she is certain that, "Every Child Can Be Educated" it depends on us. "Music is a language that goes beyond speech and letters - a living art that is almost mystical." "This is where its emotional impact comes in... Bach, Mozart, Beethoven - without exception they live clearly and palpably in their music, and speak forcefully to us, purifying us, refining us, and awakening in us the highest joy and emotion." Carol's students have gone on to bachelor programs at Rutgers, Brown, Smith, Johns Hopkins, The United States Naval Academy, and Georgetown (among others) pursuing rigorous academic studies while keeping their love of music and playing throughout their college years and beyond.